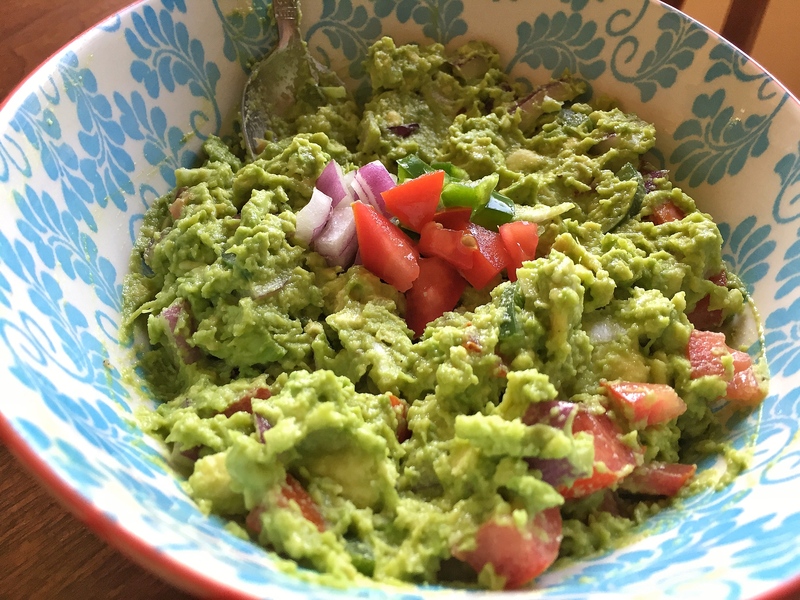 I hope you enjoy this 6 ingredient Easy Chunky Guacamole recipe! Obviously, avocado is the star of the show. The avocado is what Kobe was to the Lakers, what Justin Timberlake was to N’Snyc, what Nick Sparks is to romance novels. I think there was a reference there for everyone, you get the picture. Getting to the punchline, the avocado brings the creamy flavor and consistency to the guacamole. Red Onion is one of my favorite guacamole ingredients, it packs a spicy and fresh punch to spice up this famous dip. Garlic, as I have said again and again, is one of the most affordable ways to add flavor to a bland dish. 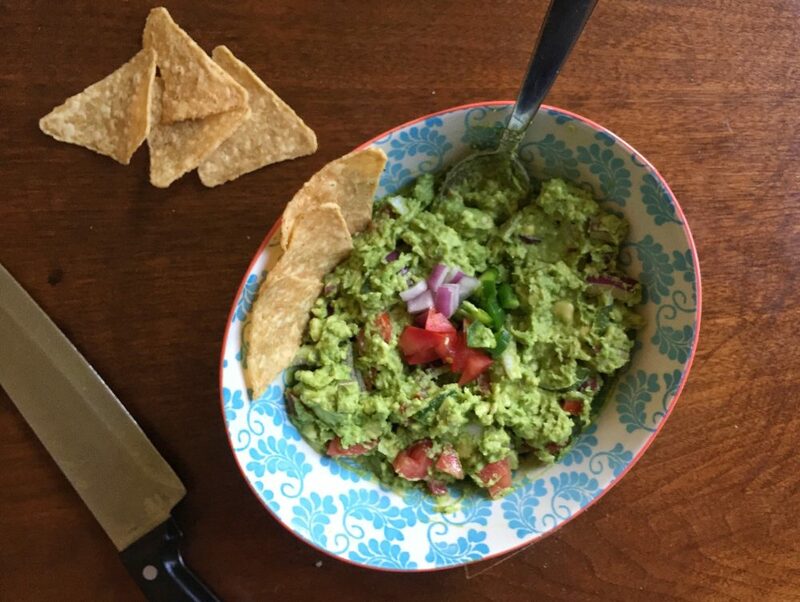 It was a no brainer in this Easy Chunky Guacamole recipe. Jalapeño brings the heat to this loaded guacamole. If you want the guac extra spicy, be sure to leave the jalapeño seeds in. If you want a mild guacamole, like I did this time around, be sure to remove the seeds of the jalapeño before slicing. Tomato brings a welcomed freshness to this guacamole. Similar to removing the seeds from the jalapeño, be sure to remove the watery flesh from the middle of the tomato before adding it. Last but not least is lime juice. The lime serves two roles, the first is to bring a nice splash of acidity to this rich and spicy guacamole. the second is that the acid in the lime juice will help keep the guacamole fresh and prevent the avocado from browning. In all seriousness though, this is a recipe you can easily make your own. 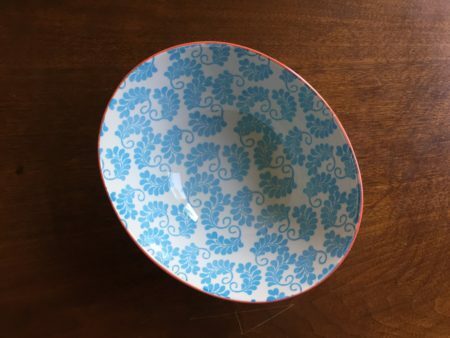 Usually, I’m not a big fan of spending money on non-necessities. Surprise. Stir everything together and enjoy! Most importantly, like most nutrition, there is more than meets the eye. As I mentioned in this article featuring Slow Cooker Avocado Chicken Salad, avocados are a good source of vitamin B6, vitamin K, vitamin C, vitamin E and much more. Basically, avocado is loaded with vitamins and healthy fats, so don’t be alarmed by the high fat content in this recipe. It’s the good kind. This brings the total to $4.98 for a large bowl of guacamole. Stretch this to 4 servings and that’s $1.25 per serving. If you’re keeping it light and get 6 servings out of it you’ll be under $1 at $0.83 per serving. Last thing… As you can see you are using 1/2 and 1/4 of some ingredients here (onion and jalapeño). I definitely recommend making some other dishes to utilize them and not let them go to waste (salads, stir frys) but you could also just double (or quadruple) the recipe and call it a party. 6 Ingredient Chunky Guacamole is the perfect appetizer for any occasion. Remove the pit from each avocado, scoop out the avocado into a bowl and roughly mash it with the back of a fork. Chop the red onion and garlic. Remove the seeds from the jalapeño and the flesh from the tomato, then chop both of those as well. The garlic should be finely chopped, and the other three can be roughly chopped to keep the guac chunky. Add all 4 ingredients to the bowl with the avocado. Cut your lime in half and add the juice of the lime to the bowl. Stir everything together until well combined and add salt and pepper to taste.